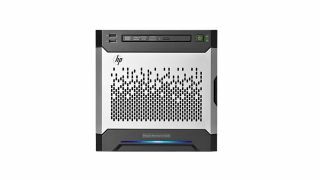 HP is launching a new range of ProLiant servers designed to help small to midsized businesses (SMBs) deploy, manage and maintain their IT infrastructure. The company is touting its two new ProLiant Microsoft Generation 8 (Gen8) models as suitable options for smaller businesses looking for their first server. Among the servers' features are centralised access to stored data and employee collaboration through data sharing, in addition to embedded remote management technology that reduces on-site server administration. Designed for small businesses with fewer than 10 employees, Gen8 provides tool-less access to hard drives, memory and PCI slots. Connectivity-wise, it houses two USB ports on the front alongside a DVD rewriter. According to HP, the new servers are half the size of the entry-level HP ProLiant MicroServer, which made its debut in 2010. It is offering the Gen8, which starts at $449 (£286), through its network of reseller partners. Based on current buying trends, at least 5.1 million small businesses worldwide are set to buy their first server within the next five years, according to global consultancy AMI Partners. HP has also announced the first phrase of its 'IT in a Box' initiative, which is seeing it team up with Google to offer a one-stop technology solution for SMBs. The company plans to offer its PCs, printer, management console, administration and customer support services with the productivity, collaboration tools and security of Google's cloud-based collaborative Apps for Business platform, which includes Gmail, IM, Calendar, Drive, Docs and more. HP says the initiative will help SMBs simplify customers' IT environment and help reduce operating costs and infrastructure requirements while improving workflow and workforce productivity. It is debuting HP SMB IT in a Box in the US in July before moving to worldwide availability by the end of the year.